It was rather impulsive of me to reach out to my good friend Kate and ask her to create a peaceful demonstration with me. It hadn’t ever occurred to me how many passionate activists were in my social network until this week. 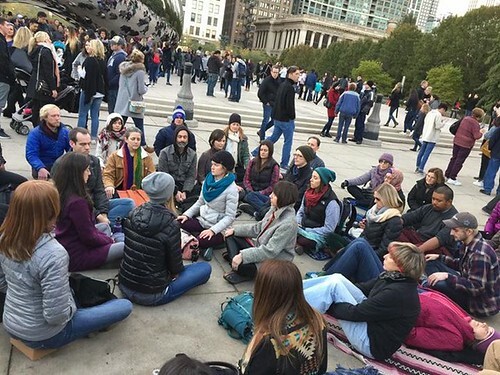 We hoped a peaceful demonstration of meditation would bring people together for something that supports wellness, peace, and betterment for our social climate. We reached out about the legality of gathering in a public space, had a few location changes, but ultimately we had lots of support present at the gathering. Come sit in silence. Let’s demonstrate peacefully and sit to hold space for our community to heal. We are attempting to mobilize people towards healing and taking a step towards bringing our divided communities together. If you agree that meditation can be a powerful means for processing your emotions and holding space for others please join or spread the word! All people welcome. At moments we wondered if we were blindly leading others into an angry mob. Our gut said just show up, sit down and see if anyone catches on and joins in. Well, words really can’t do it justice to explain the feeling that overwhelmed me when I opened my eyes after 47 minutes of meditation and our group had grown 3 fold. This was a beautiful and touching experience. We were few compared to all the tourists but those closest to us seemed to be touched by the sound of our resounding chant of “aum”. It was a perfect crisp night with the moon rising over the lake behind us. It was calm. There was a softening. I hope we inspired each other that a moment of calm created amidst a commotion is a much needed, nourishing pause. With a clearer mind and heart, a union of unlikely opposites, may we move forward together.